That code can be either the AF sensor is too sporadic to maintain the proper fuel ratio or there is a problem like vacuum, fuel delivery or other metering with the air flow. The ECM is unable to keep a steady fuel trim. If you were to look at the data stream, you will probably see that the trim is all over the place or really high positive or negative. It may even stay in open loop fueling with the code set. Thank you Cardoc. I have been out of town this past week but will soon be trying your suggestions. It won’t hurt to check the timing belt as well. I like the idea of running open headers just to take the cat out of the loop. 08 5MT, ~230,000km, purchased in August last year, every service page was dealer-stamped. So far, very happy. I do the minor services like oil+filter changes, fuel additives, coolant flush, etc, but I'll leave the major servicing to the dealer. I live in Australia about 400 metres above sea level, and most of the driving happens there. Speed limits from 40km/h to 80km/h. It's a 15 minute drive to town at 80km/h, so the car gets to operating temp and I presume it gets to closed-loop mode I use a local fuel depot Premium 95 (I've had problems with their 98, so I avoid it), and the car seems OK using that fuel. I can drive around this altitude for weeks and not have any problems, but on the occasions I have to travel to Brisbane (about 90 minutes' drive), I can just about guarantee the car will throw a P420 error code within 5-10 minutes of hitting the highway (the highway is at sea level). So, the changes to the cars "normal" life are: increased air pressure (it's enough to make my ears pop slightly when coming down to sea level), slightly increased temperature (it can be anywhere from 2 - 5 degrees C warmer on any given day at sea level), and flooring it in 3rd or 4th to merge with highway traffic at 110km/h. I use the Bafx dongle and Torque Pro to scan and clear codes, and to watch some of the sensor data. One thing I noted last time I hit the highway and had to stop and clear the P420, was watching the CC temperature afterwards. The external temp along the highway varied from 25 to 28 degrees C, and the indicated temp of the CC was stable up around the high 700s, until the external air temp got to 27 degrees, when the CC temp started to climb and didn't stop until over 900! (That's if I'm reading it right, of course). 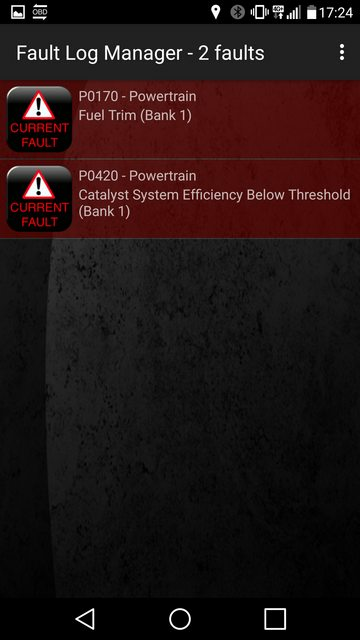 Is it possible that the CC, or one of the O2 sensors, could overheat temporarily and mis-read the conditions, leading to the P420, or should I be looking for something else? Torque Pro has a data logging mode, if I use that, what should I look for? I have had a car throw a CEL with an altitude change. It went away after a few drive cycles. At that time I didn't have any easy means to read the code and the car was running fine. probably a P0420. Well! I turned on data logging in Torque Pro yesterday for a trip to Brisbane. Cat temp, O2 sensor, coolant temp, fuel, etc. Expecting to get gobs of data to help diagnose the issue. And the **** thing stayed healthy all the way! Despite higher ambient temps (30 - 32 C) than mentioned in my above post. Grrrrr..... I suppose I'll just have to clear the log and start it every time until I get a 420. Im still waiting for my VAG-COM cable to come in the post, but in the meantime I have had a few issues with my ignition leads. After I took my PCV Valve out to clean it (had to remove coil pack and leads), the car was misfiring under heavy load. Diagnosed it to the leads arcing back to the coil pack. Leads must have been old and brittle and cracked when i removed them. So, new leads for my outback, and I decided to do plugs as well because I had no idea when they were last done. I took the first lead off and noticed the spark plug tube was covered in oil. When removing all of the plugs it seemed like they were all swimming in oil. Did some reading and old/cracked tube seals seems to be a common issue with these engines, allowing oil from the rockers to flow down into the spark tube, causing inefficient sparking. So, is this a common issue that causes a P0420? If it hasnt been sparking properly then unburnt fuel will be getting pushed back to the CAT and burning there, over time killing my CAT? You may also want to check the coil pack towers for cracks. Any "leak" at the coil tower or cable boot will cause insufficient ignition at the plug. The spark plugs tube seals are a problem on any car with mileage. The gasket/seal hardens and deteriorates over time just like the valve cover gasket. They get a lot of heat. And to answer your question, yes. Some energy can get to the plug and cause it to spark, but a weak spark results in unburned fuel and increased carbon build up. The unburned fuel going through the cat is in excess to what the cat was designed to handle so it doesn't heat up and over time gets a build up of carbon which leads to restriction and inoperable cats. I finally have some test results using a full tank of Mobil 93 octane and some octane booster. It seems to be improving, I think. I did notice that the idle test at end looked better than the first idle test (engine coolant temp was a bit higher). It's hard to decipher what is going on in the accel runs but the 70 mph cruise run seems to be behaving fine. I'm still not quite sure if knock correction is what it should be. I much appreciate your input. Cruising looks good. It's the others that show what's going on. The Cat is working when the ECM is not correcting for the knock or misfire. If you look at the relationship of the knock correction to the rear O2 waveforms, you'll see it. If the combustion chamber is clean, you have good plugs in, obviously you have high octane fuel, then the only thing I can think of based on all the things you've done that would be causing the knock absent a weak injector would be a restriction in the cat that upon instant throttle application is causing too much back pressure and it's misfiring.